Though Adamson lacks Lewis' storytelling confidence...The Lion, The Witch and the Wardrobe still comes across as a quirkily diverting children's entertainment. 140 min. Walt Disney Pictures. Director: Andrew Adamson. Cast: Georgie Henley, Skandar Keynes, William Moseley, Anna Popplewell, Tilda Swinton. Watching Hollywood give the full treatment to a beloved story can be a disconcerting experience. Personal nostalgia taints the waters, and one remains on guard against runaway CGI, Bruckheimer-style editing, and other threats to the tale's relatively simple charms of humanity and wit. In adapting C.S. Lewis' The Chronicles of Narnia: The Lion, The Witch and the Wardrobe, director Andrew Adamson proves a faithful servant to two masters: Lewis and Walt Disney Pictures. The credits roll as a train transports a batch of children to the site of an adventure, and the visual code is clear: Harry Potter fans, start your engines. In wartorn 1940s London, a mother packs off her four children to the country home of a retired professor (Jim Broadbent). The Pevensie children—Peter (William Moseley), Susan (Anna Popplewell), Edmund (Skandar Keynes), and Lucy (Georgie Henley)—span from teenage to moppet-size, but they are tightly knit by family and shared experience. They're also experienced bickerers, so when their youngest, Lucy, insists that her domestic exploration took her through the back of a wardrobe and into a snowy wonderland called Narnia, tensions rise. Lewis' magical world of Narnia shows at least as much diversity as J.K. Rowling's or that of Lewis' friend J.R.R. Tolkien. Lewis adds fauns and dryads—as well as talking beavers, wolves, and foxes—to phoenixs, unicorns, centaurs, giants, and dwarves. The menagerie stars in an epic, Braveheart-style battle in the end, but Lewis' story starts precociously with a boring, rainy day, then proceeds to a walk in the snow and warm company for teatime. Even when danger becomes overt, the young heroes are accompanied by valiant, roly-poly beavers. Thus, it's not surprising that screenwriters Ann Peacock and Adamson and Christopher Markus & Stephen McFeely start their film in the sky over London as German bomber planes firefight and drop their payloads on 1940s London. The initial interpolation is jolting (though it's inferred by Lewis), but provides an opportunity to set the children on edge and visually counterpoint the Narnian war, often glimpsed, Alexander-style, from a bird's-eye view. A few other action sequences are invented—a few more than necessary for this 140-minute adaptation of a slim source novel. Adamson, co-director of Shrek and Shrek 2, still seems more at home with pixels than people: the film has a kind of clumsy showmanship about it that overshadows Lewis' natural charm. As for the author's Christian allegory, it hasn't gone anywhere. Aslan is still a Christ-like confessor to the awed children, and he still has a Judas to trigger his passion play. Young Keynes succeeds in making Edmund relatable and redeemable; in this way, Lewis did his Biblical origins one better, though his feline Messiah hardly turns the other cheek in the climactic battle. Those looking for trouble in the film's subtext might do better to trace the good-and-evil clash to its affirmation of divine right (at least Lewis dodged hierarchies of lineage and gender, equally to exalt his rulers). Too-rare flashes of humor bring breaths of fresh air. Overlooking the enemy hordes, a centaur intones, "Numbers do not win a battle," and nervous golden-boy Peter replies, "No, but I bet they help." Unfortunately, the film is more often dry than dry-witted. The kids are alright, but a bit blank, so credit is due to Swinton, Neeson, James McAvoy (as friendly-faun Mr. Tumnus), and Ray Winstone and Dawn French as Mr. and Mrs. Beaver for their character-driven commitment. Though Adamson lacks Lewis' storytelling confidence, The Chronicles of Narnia: The Lion, The Witch and the Wardrobe still comes across as a quirkily diverting children's entertainment. The Chronicles of Narnia: The Lion, the Witch and the Wardrobe—long available in deluxe DVD editions—now comes home in the hi-def glory afforded by Blu-Ray, and the audio-visual transfer is a stunner that handles the film's landscape photography and digital effects with equal aplomb in a lushly three-dimensional image accompanied by an immersive sound experience. The new two-disc Blu-Ray set replicates the previous two-disc DVD Collector's Edition in its array of excellent bonus features. The first of two audio commentaries rounds up director Andrew Adamson and the young ensemble of Georgie Henley, Skandar Keynes, William Moseley and Anna Popplewell. The track has an infectious energy, with the obviously affectionate cast falling over each other with reminiscences and good-natured kidding; the track also exhibits Adamson's effective chemistry with the kids as he talks through some of the tricks of the trade. A second track teams Adamson with producer Mark Johnson and (byphone) production designer Roger Ford—this one's a bit more disciplined and thorough in detailing the location and effects work, but the former track delivers more pure entertainment. "The Bloopers of Narnia" (4:36) catches the youngsters in their goofiest of moods, "Discover Narnia Fun Facts" is a pop-up trivia track for optional viewing with the film, and introduced by C.S. Lewis' stepson Douglas Gresham (also an exec producer on the film). Disc one's trailers (in high-definition) include Tinker Bell, Sleeping Beauty, National Treasure: Book of Secrets, The Nightmare Before Christmas, Wall•E and (natch) The Chronicles of Narnia: Prince Caspian. On disc two, fans will find a treasure trove of additional bonuses. 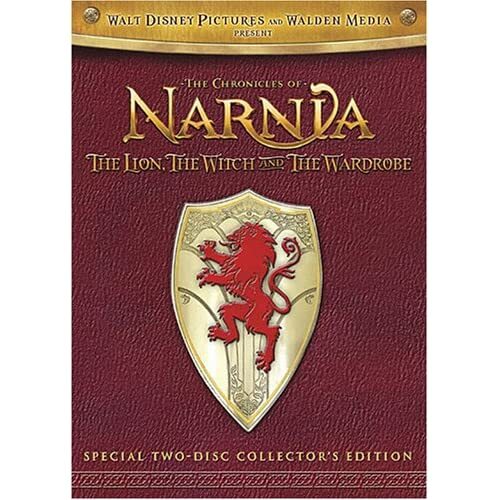 The Creating Narnia section encompasses two documentaries: "Chronicles of a Director" (37:45), which not surprisingly details Adamson's journey from hiring to post-production (with testimonials by the cast and crew) and "The Children's Magical Journey" (26:22) takes a similar tack in exploring the leading kids' wide-eyed experience of starring in a big-budget film based on a legendary property. Evolution of an Epic comprises four parts. "From One Man's Mind" (3:55) lays out a hasty bio of C.S. Lewis. "Cinematic Storytellers" (55:06) is a comprehensive collection of craft-focused interviews with, in turn, Richard Taylor of Weta Workshop, Howard Berger of KNB Creature Shop, costumer Isis Mussenden, production designer Roger Ford, director of photography Don McAlpine, editor Sim Evan Jones, composer Harry Gregson Williams, and producer Mark Johnson. "Creating Creatures" (53:15) is an all-access tour of the design wing and creature shop, while "Anatomy of a Scene: The Melting River" (11:31) details one scene from conception to completion. Lastly, Creatures, Lands and Legends brings together guides to the world of Narnia. "Creatures of the World" (14:14) is an animated glossary of Lewis' wondrous characters. The interactive map "Explore Narnia" allows clickable access to one or two-minute clips featuring a given location. 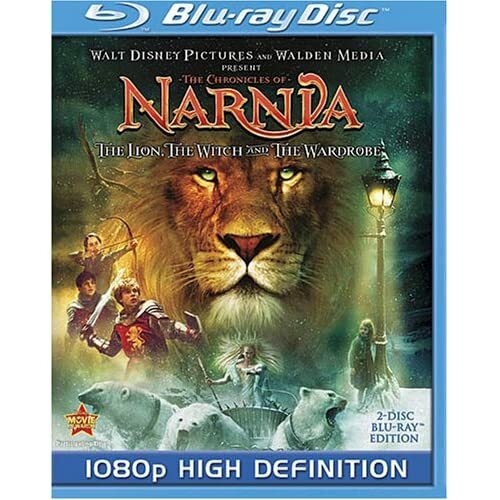 All of these features from the original DVD come in standard definition, but the Blu-Ray has an exclusive bonus feature in 1080p high-def: the interactive game Battle for Narnia. Someone has put a great deal of effort into what's usually a genre of feature aimed at the most indiscriminate of tots. It's essentially a Narnian, card-based battle game, that can effectively draw one into navigating the landscape, recruiting allies, and collecting useful weapons and talismans to defeat the bad guys. The only complaint one might have with this Blu-Ray set (other than the features being in standard def) is that it isn't definitive. Rabid Narnia fans know that a four-disc DVD edition offered an extended cut of the film and more extras, including a feature-length doc on Lewis. Disney no doubt intends years of double-dips and packages as the sequels accrue, but if you haven't yet invested in this title, this is a genuine special edition with a reference-quality presentation of a highly visual film. If you've been looking for a demo disc, you may have found it. All site content © 2000-2019 Peter Canavese. Page generated at 04/25/2019 05:13:38PM.